Many books on sustainability have been written in the last decade, most of them dealing with agricultural systems, communities, and general business practices. In contrast, Handbook of Sustainability for the Food Sciences presents the concept of sustainability as it applies to the food supply chain from farm to fork but with a special emphasis on processing. Structured in four sections, Handbook of Sustainability for the Food Sciences first covers the basic concepts of environmental sustainability and provides a detailed account of all the impacts of the food supply chain. Part two introduces the management principles of sustainability and the tools required to evaluate the environmental impacts of products and services as well as environmental claims and declarations. Part three looks at ways to alleviate food chain environmental impacts and includes chapters on air emissions, water and wastewater, solid waste, energy, packaging, and transportation. The final part summarizes the concepts presented in the book and looks at the measures that will be required in the near future to guarantee long term sustainability of the food supply chain. 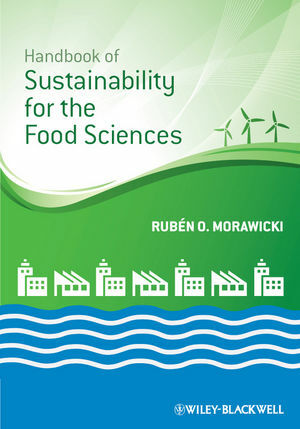 Handbook of Sustainability for the Food Sciences is aimed at food science professionals including food engineers, food scientists, product developers, managers, educators, and decision makers. It will also be of interest to students of food science. The author has a very well rounded and diverse academic background in the areas of management, chemical engineering, food sciences, and the environmental. This background – that is strongly complemented with industrial experience in the largest protein animal producer in the world – gives Dr. Morawicki a clear view of the broad picture that is necessary to write a book of this nature as a single author.